You are here: Home Forum Home Chrysler/Force Engines Thanks for the new forum! Thanks for the new forum! TOPIC:	Thanks for the new forum! Might as well get something going here. I don't care what some say about Bayliners/Force. Mine is one the best "does it all" boats owned! 1988, bought used 20 years ago, slipped in salt, takes a licking and keeps on ticking! Only problems been a bad stator (known problem, starts dropping fire to one or more plugs)), upgraded to Merc, and zero problem since. Also snapped a driveshaft, but it was corroded up top from salt, and hit a log and had to replace that. Otherwise, still runs great. Only one bit of caution that motor. NEVER EVER pull the side screw in the bullet the L/U. Thats NOT the drain plug! It a long bolt that holds the shift fork in place. Ya pull that, the fork drops, and the guts need to come out to get it back in. Drain is way under the nose, small hex screw. Plus the dog likes it! 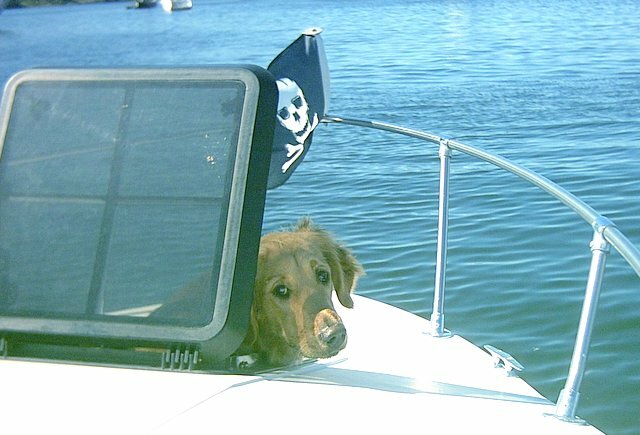 Nice boat, dog, flag and engines! Welcome to the new forum, you guys speak, we listen. I wish she would keep a eye patch on! She loves cruising the marinas barking at people! You're welcome! Well actually I just suggested some adds and a reorg. Thanks to whoever admins this site. 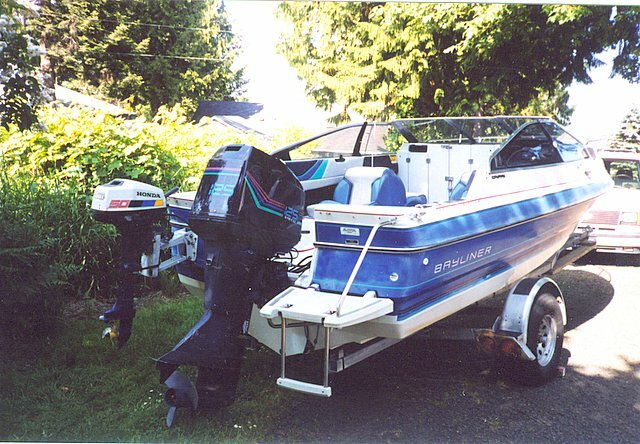 Robby, later this week I'm going to look at a 1994 Bayliner Capri 1700LS with a Force 120. It appears to be in exceptional shape, price is good, new impeller, and owner is fine with a test run. Any other thoughts on the overall build quality of the Bayliners, things to look for when I'm checking it out? The one thing I've heard about them is the upholstery tends to go south pretty quickly, but this one looks good in the pics. 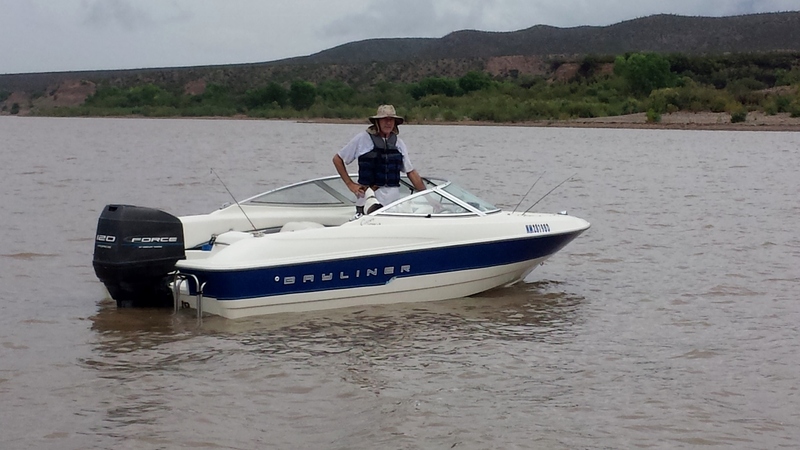 "Robby, later this week I'm going to look at a 1994 Bayliner Capri 1700LS with a Force 120. It appears to be in exceptional shape, price is good, new impeller, and owner is fine with a test run. Any other thoughts on the overall build quality of the Bayliners, things to look for when I'm checking it out? The one thing I've heard about them is the upholstery tends to go south pretty quickly, but this one looks good in the pics"
Well, not much I can think of but the usual inspection. And being a 94, most older Force problems have been addressed. 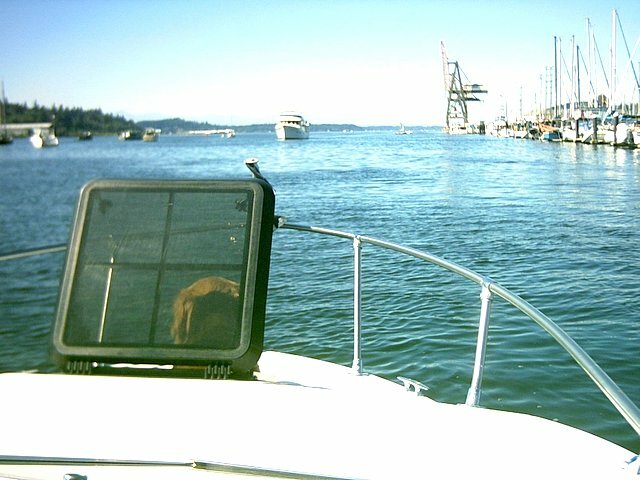 Not sure the 17, but Bayliners (mine anyway) are deep 'V"s, (handle rough water just fine) have a 25" transom. Mine was the last the one piece D/S, then went to 2 piece later. I broke a DS when I hit a floater. Sucker is long! So be aware it could be a 25" but no big deal unless ya want to someday repower. My interior is still holding up, but seats are cracking from the years in the sun. Don't bother me, as never thought I'd get this many YEARS out of it. The one thing I did long ago was have a full windshield/sides to transom rear cover made. Easy to snap it on/off, keeps weather out the inside. Gelcoat faded, but again, don't bother me. Most 17's I've seen had 85hp, so with a 120, should run damn good. Keep us updated here! Checked it out today. Clean boat, and that 120 runs real well. Tons of power for a 17 foot boat. Floor and transom are solid. Seller says it will hit 50 mph with one person aboard. I didn't bring my GPS but I would guess we hit 40-45 with two on board, with the motor trimmed out. The lake was glassy but we did cross our own wake a few times at speed and it handled that well. I like the lines of the boat as well. Sporty. Looks pretty nice Norm, congrats! Thanks Mark. Not a Glassic for sure, but a nice boat for a 20 year old. I crawled over under and through it all day today and everything looks good. New Interstate battery, dual battery setup, all new load range C radial trailer tires, Blaupunkt stereo with 50+ watts per channel, fish finder, everything works. 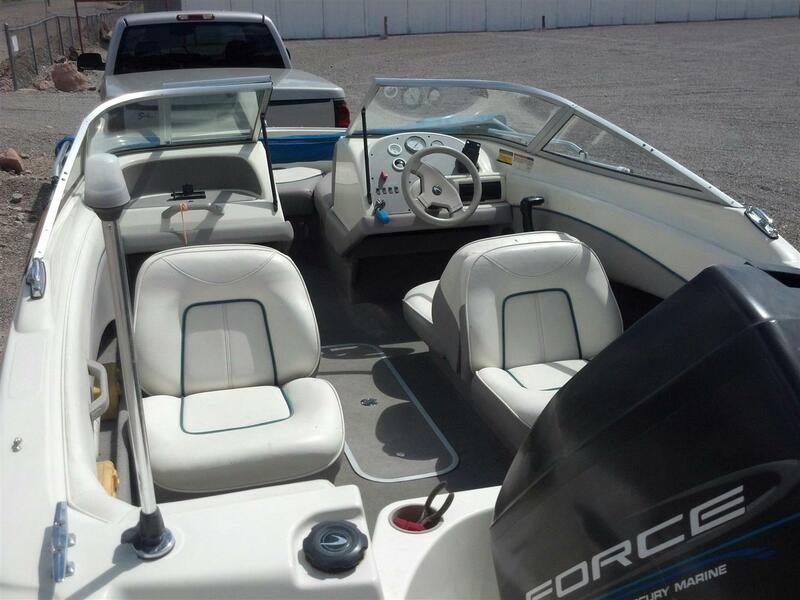 So, yet another boater goes over to the darkside, Bayliner ownership! This will give me time to work on the Glasspar and Merc 650 without starving for lake time. Tomorrow morning it's back to the lake to wring it out and decide where the rod holders will go. I did take a few minutes to uncover Swee' Pea (the Glasspar), climb aboard, and talk nice to her, so she won't feel so bad about staying home this time. I think she took it well. Looks like excellent shape for its age! Have fun with it! I will, Robby. It ran great at the lake today. However, the prior owner's tales of 50+mph must have been based on the now non-working factory speedometer. Best I could squeeze out of it was 40mph, using gps for speed readings. Still, pretty decent. Also idles down to trolling speed of 3mph and idles along nice and smooth. I ran past my son's boat at speed a couple of times and he says it really trims out nice, only a small amount of hull in the water at full speed. Very stable. Never heard of this setup before: The pitot tube that drives the speedometer is located inside the lower unit on the 120. From what I hear, it's common for the speedo to stop working after the owner changes his impeller. Mine was changed within the last year and Voila, no speedo. I guess there's a tube that folks forget to reconnect in there. When we launched today it was raining pretty hard. The photo is me right after the rain stopped. I was wearing the ski vest and boonie hat to stay warm! My manual (Seloc) only goes to 1993. And also that the FIRST thing I buy with any motor I get! Wish everyone did the same, as, well, its made for a reason! Like read this first! Anyway. Seems from what read other forums, theres a small hole front middle the gearcase about the size of a match head. Thats the pick up speedo. See if its clear. Best I can help ya with. And really the last thing ya need is a speedo, but its no fun to look at a dead dash gauge. You can always just get a new speedo, tube, add a in water Pitot pick up, and bag the old stuff. Also looking Boats.net, see yours still has the side front bullet Phillips head screw for holding the shift fork. NEVER TAKE IT OUT! Its not a drain. Drain is front and under the bullet. Heres a diagram, PN6. I'm glad you brought that up Robby. Examining the motor and the diagrams, I believe the 120 Force I have is actually newer than 1994. My lower end is more like a 96-97. Doesn't have that troublesome screw, the fill, vent and drain plugs are all on the right side of the case, the skeg and bullet are shaped different, the anode trim tab is a different design, and the cooling water inlets are in vertical rows on each side of the case. Looks like the original owner (I'm the 3rd) changed out the motor. Had to be done over 7 years ago. 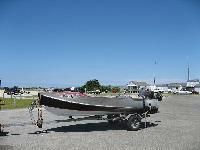 Title still reflects the original motor number, my state MVD has no provision to update the titled engine number on boats. Haven't found the serial or model number on this one yet. Sure does run nice. Oh, and that curly looking black tube on the front of the case is the speedo tube where it enters the lower unit. I agree, I really don't need it, my phone has a gps speedometer in it. 2nd owner knows nothing about a swap, he had the rig from 1997 to last week. Ever hear that Johnny Cash song, One Piece at a time? LOL. Damn boats! Some times after 55 years still "at it" Seems 99 hours work, for a hour "wet". But get me ten feet off the slip?..Still "Heaven/freedom" to me! Anyway. From a good source here on what mentioned..Force/Mariner/Merc, my buddy Thom Adams, the famous "Dr Frankenmerc". On the G-3 he had a XS1500 wrap azz end it. But the PH was a newer Mariner 150 hp PW! Guess bolted right up. (Sorry Thommy, cats out the bag it, but as parked now soft transom"). But he's a master of "the hell it won't fit!" "Watch this!" On yer Force? So damn many conflicting stories those years. But when my 1988 125 started intermittent spark drop? Simple needed a new stator, and one power pack. Upgraded to Merc new stuff. Zero prob since. Kinda funny me, as "cruise" the marinas here. People say "what year is that?" "1988 and 26 years old too"! Say back .."and Force/Bayliner that is NOT BEING PADDLED IN, sunk or broke"?" One thing I can tell ya, (from the "Doc" here, my motor). Motor has Forged pistons, not cast. Warm it good before WOT. Also suggest on the trailer now. Get a can Seafoam spray "Deep Creep" Get the motor warm on muffs. Shoot the carb intakes a bit at a time, then spray all until motor die's. Then do the best tilt up horizontal after pulling the plugs out. Soak spray the pistons. Let it sit over night. Next day, (after carb cleaner the old plugs, crank/spin it over to blow out any left), get ready to fire and smoke out the "hood" Then get it wet, old plugs..(probably will foul one, as loosen the carboned up P-rings). I use to fall off plane a 3100 R's. Did the "D/C?" HA! STILL on "Plane at 2600! Been awhile now, probably time to "D/C? again. Try it........and carry a spare set plugs when wet... as drops a Cyl?..just feel heat off one, NOT? then shove a new one it. Thanks for the tips. Especially about the warmup before WOT. Robby, took the boat fishing for 2 days this week. Spent 10 total hrs running it, almost all at idle trolling speed. Had brand new plugs and at the end of day 2 I picked up a miss at around 1/2 throttle. Ran it up to full throttle, smoothed out and when I dropped back to 1/2 the miss was gone. Back home I checked the plugs. All 4 were pretty dirty with #2 being the worst. Shot them with some carb spray and electrical cleaner and they look new again. I think it may need that Deep Creep treatment to clean up the innards. Also I haven't adjusted the idle mixture yet, didn't want to start changing things before evaluating the way it runs, but I do think they're a little rich at idle. Other than that, ran great. Running 50:1 TCW3 oil plus Marine Sta-Bil. After I cleaned the plugs I put them back in, but put #3 and 4 into the 1 and 2 cylinders, and put 1 and 2 in the 3 and 4 holes. (3 and 4 seem to run cleaner). If #2 fouls again I'll look into the idle mix and electrical, but I think this was mostly due to all that trolling. Also might try synthetic TCW3 oil but that would cut into my beer budget. Well they sure look pretty funky. I don't think Force like long idle periods. Mine doesn't but cleans up on the punch. I would think about putting a kicker motor on if your going to do a lot of trolling. But sure, go ahead and spray the Deep Creep. Put the old plugs in, warm it up, spray the carbs high idle (just use your hand on throttle blade shaft)then soak it until it dies. Plugs out, tilt up the motor and spray/soak good around the jugs. Plugs lightly screwed in, and let it sit over night. Then plugs out, tilt down and crank the motor to blow out any leftover stuff. Then old plugs back in and go ahead and "smoke" out the neighbors! Then best to get it on the water under load with the new plugs (carry some spares as one might still foul). Also do a comp check before and after and see what numbers ya getting. For many years I worked in the boat standards division at CG HQ and we were the ones that took all the consumer complaints about recreational boats and tracked boat recalls. We got far fewer consumer complaints about Bayliners than most manufacturers. There may have been a handfull of builders that had less but when you figure in that Bayliner is the largest volume boat manufacturer in the world and and makes about 10 times as many boats as anyone else, they are doing pretty good. Their poor reputation is primarily BS put out by their competitors. Now this does not necessarily apply to Force engines. The early ones before Brunswick (read M e r c u r y) bought them were pretty crappy. But after Mercury took over quality improved. "Don't tell me that I can't. tell me how I can." I plan to do the deep creep thing. So far, locally, I've only seen seafoam in the pour type can. I may need to go on the web for some spray. Happy to say I only have one neighbor close enough to notice the smoke, but the local volunteers may come visiting to see if my place is on fire. Ike, I've heard so much bad talk about these boats I never thought I'd buy one but I find it's pretty darned solid at 20 years old. The most common problem I've seen on them is rotten upholstery, but nowadays Wise makes drop-in replacement lounge seats for them for not too much, and there's also a place I found in Fla where you un-staple the seat covers, ship them to Fla and they make new ones to fit out of good marine vinyl, for less than an upholstery shop would charge. Mine has a couple of wonky gauges (speedo and voltmeter) but those are made by Faria, not Bayliner, and easily replaced. The hull, floor, transom are as solid as any I've owned, and even the carpet is still good. It's ironic, I recently visited a forum dedicated to Bayliners, and found that within that much maligned brand there are still some sub groups of brand-bashers, trash talking about Bayliners that aren't just like their particular setup. Guess everyone needs to look down at someone, lol. Meanwhile, I'm getting the itch to get the Glasspar back on the lake. A fun boat that gets lots of compliments, even if the exhaust gas from the Merc tends to choke me in a tailwind. I've seen my share of boats out here SOOOOOOOOOO neglected it aint funny. Sitting bow down uncovered in the winter rains sure aint gonna help, and I don't care who makes it. On Deep Creep, Napa has it. OK first off, seems like ya got the boat recently, but thread is months old! Anyway, on Seafoam..(still a dumb name to me? )and Deep Creep, I had to look again the MSDS sheets. But before I go on, I remember when long ago at work (Machinist, Reynolds Aluminum), when the for once the EPA did something right. The MSDS sheets all chemicals used in the plant. We got books as big as the damn "congressional records" Jeezz, we had a BIG wash tank the size of a 12 person hot tub for cleaning lowered down in from the overhead 50 ton crane. What was the solvent? 1.1.1 Trichloroethane. You would get a buzz standing on a platform over washing big gears, etc And get a headache too. OK, back to the subject. The MSDS sheets show this difference between the two. So my take is if D/C hard to find, just put some Seafoam in a squirt bottle or something to that effect, and do the same as ya would D/C. And don't worry about the smoke, as not some smoke bomb going off, just smokey. In fact I just pickled my go kart SF. Siphoned out most the gas, a big dose SF in, and ran it until smoking. Shut down, and will sit until spring now. Thanks Robby. I know I can find the deep creep on my next trip to "the big city". Las Cruces NM. And yes, your thread is 3 months old, but every new post makes it "new" again. One question, regarding this: "Sitting bow down uncovered in the winter rains sure aint gonna help, and I don't care who makes it." ...You mean, it rains in Washington?? Actually more like a drizzle and it happens in the winter months so no big deal me as out in the shop messing stuff. Summers are damn near perfect (as today) so that makes up for it. By the way, Florida get same average rain as us. But ya don't sweat summer here and I aint no fan of "humid to put ya on yer knees"! You don't get much so I'll send ya some winter..throw it IN the boat! Or go to SoCal and sell it?